The island with many beauties. The roofs of the houses, the sea where Ikaros drowned when the sun melted his wings of wax. 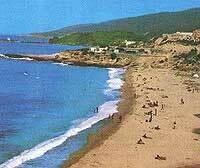 Dionyssos was born In Ikaria, near Drepano. 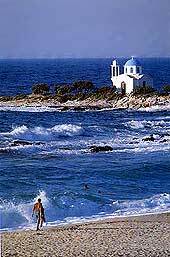 .The primitive beauty of the island, the kind people and the monuments will please those who decide to visit Ikaria. Ikaria was named after Ikaros, the son of Daidalos. Ikaros escaped from the labirynth of Crete with his father using wings which were glued on his body with wax. While flying, Ikaros didn't pay attention to his father's advice and flew high towards the sun.The sun melted the wax that was holding the wings and Ikaros fell to the sea and drowned. Therma, Fanari, Karkinagri, Karabostamo, Fitema, Kambos, Gialiskari, Mesakti, Livadi and Nas. Sailing, water sports, basket, tennis and ping-pong. Discos and pubs can be found in Agio Kiriko and in Armenisti.